I run a small breeding cattery and all my cats live inside and have a cattery that they can go out to during the day. I have been a Veterinary Nurse for 29 years and have been breeding for 7 years. Devon's are very special cats. They are very mischievous, loving characters, who love people and other pets. My aim is to breed healthy happy Devon's in a home setting. They are socialized, litter trained, had nails cut, ears cleaned and bathed before they go to their new families. My cats are strictly inside cats, they can go outside in their cattery but not to free roam. For their safety they are inside where they have plenty of environment enrichment, toys, other cats to play with and interactive toys are a must. They are happy being inside and don't need to go out to free roam. Devon's are very social cats and need a fur friend or a human friend they don't like to be by themselves. They love to play and be with their Hooman. My cats are not caged they have free roam of my house. I do not cage my queens for breeding. In 1960, an English woman, Beryl Cox, found a cat with a strangely curly coat near an abandoned mine near Buckfastleigh in Devonshire. She hoped to breed from him, but despite many attempts to catch him, he always eluded capture. However in 1960 he mated with a stray tortoiseshell and white female, and she produced a litter of kittens. Mrs. Cox, who lived near the tin mine, and who had been observing the strange looking Tom for some time, had befriended this queen. The litter was born in a field at the end of her garden and, taking a closer look at them she was able to see that one of the kittens, a male, had the same curly coat as the wild Tom. She took this kitten and raised him carefully in her home. 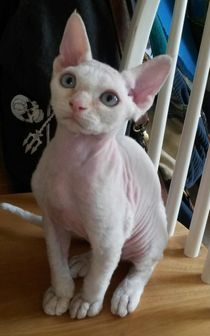 Named Kirlee, he was to become the founding father of the Devon Rex breed. 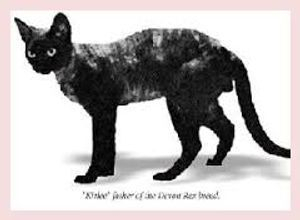 Miss Cox had seen photos of the Cornish Rex Cat Kallibunker, who had been discovered nearby ten years earlier, and contacted the group, who were developing that breed, with a view to a mating. They took Kirlee and mated him to several of the female descendants of Kallibunker, but to their astonishment found that all the kittens born from these pairings were straight coated. Despite repeated attempts, the Cornish x Devon cross did not produce a single curly coated kitten. They were therefore forced to the surprising conclusion that, despite the geographical closeness, the wavy haired gene of the Devon Rex was not the same as the one, which was causing the wavy hair in the Cornish Rex breed. The two recessive genes were therefore named (r) for Cornish and (re) for Devon. 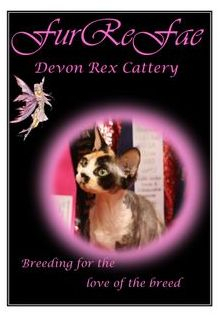 Because of this difference, the only way to establish the Devon Rex as a distinct breed was to in-breed from Kirlee. A similar in-breeding program had been successfully employed with Kallibunker. Kirlee was mated with his daughters and before long the Devon Rex Cat was safely established. Kirlee lived a long and productive life, until he was eventually killed in a road accident in 1970. Around 2-15% of the worlds population is allergic to cats and 1/3 of these have a cat in their home. Up to 40% of Asthma sufferers are sensitive to cats. A large proportion of cats surrendered to shelters are from allergic pet owners. Up to 25% of Rex cats that are in need of assistance from rescue organizations are there because their new owners cannot cope with their allergic reaction to their Rex cat. Cats bought because of their so-called hypoallergenic nature. Many allergic people report more or less allergic reactions to individual cats. Considerable allergen variation exists between cats and at differing times the same cat. Allergic Symptoms may not occur until there have been several days or weeks of continuous exposure to the cat. There have been reports of both, reductions or an increase in symptoms after long-term exposure to cats. An asthma study by Thomas Platts-Mills, MD, PhD and his colleagues showed that high exposure to cat allergen appears to be protective for some children and a risk factor for others. The prefix "hypo" means "less than" and thus the word hypoallergenic tells the kitten/cat buyer that the breeder believes the cat to to produce fewer allergens than other cats. How is this measured or regulated - well it isn't. There are no legal regulations defining allergens (let alone allergens in cats), nor are there any guidelines. So the world "hypoallergenic" has very little meaning. Male cats produce more allergen than female cats and neutered males produce less than non-neutered males (but not always). Kittens produce less allergen than adult cats. A study of 321 patients with allergies showed that dark-coloured cats where 4 times more likely to cause more sneezing, wheezing and overall allergy-symptom than light-coloured cats did. Another study showed cat allergen levels in domestic living rooms are not related to cat colour or hair length. Woollen sweaters retain more cat allergens than cotton tops even after washing. In truth, a rex cat is no different from any other cat and produces allergen like all other cats*. They are not hypoallergenic by any means, as claimed by some. Then why do some people seem to have no allergic reaction to rex cats? There is no simple answer to this question at this time, and more research is required to get the answers needed. One possible hypothesis is that as rex cats have less hair to shed, they simply deposit less allergen-laced hair around the home. But, whatever the reasons some allergic people seem to tolerate them. From personal studies and observations by Margaret Lawrence in the UK, she found that around 10% of people allergic to cats tolerate rex cats. Please, before you race out and look for a rex cat, remember you should always test your allergies by visiting home or catteries that only own rex cats, and test continuously over several weeks or months. As you don't want the poor little kitten to be re-homed if you find out you are allergic to him or her. Don't let your new cat become another statistic at a shelter. If anyone developes allergies to their devons PLEASE contact me and we will work something out. I don't want my kittens/adults to end up given away or at a shelter. The primary cause of allergic reactions to cats is caused by allergens found in the cat sebaceous glands in the cat's skin, such as the allergenic glycoprotein called Fel D1 (short for "Felis domesticus"), it is also secreted via saliva in lesser quantities. When cats lick themselves, they spread this protein, which is rather sticky, and glues itself onto dust particles, the home, your clothing and their fur; whether it's long, short, straight, curly, or absent. As all cats have sebaceous glands, all cat breeds can potentially cause allergies. Allergic allergens are also found in the faeces, serum, urine, mucous, dander, and hair roots of the cat. Washing your cat 2 times a week has shown to help reduce the allergen levels. Ensuring that you wash and rinse it well. Studies have shown that the accumulation of of Fel d1 on the skin is restored within two days. Fel d 1 levels on the skin of the cat are dramatically higher on the facial area than chest. Make sure you wash that face well. The use of allergy wipes such as Allerpet, has proved effective in reduces cat allergens on the cat and thus your home (studies showed that it was effective for around 80% of its users). Ensure your cat is spayed or neutered. Wash your hands after handling your cat and refrain from touching your face or eyes. Wash clothes frequently and wear more cotton and less wool. Keep the house as clean as possible by washing floors and bed linen often with hot water to eliminate the allergens. Wash clothes and bed linen using detergent solutions at 25°C (77°F) for at least 5 minutes - to extract cat allergen from bedding and clothing. Use dusting sprays whist dusting to minimize dust spread. Carpet is more likely to hold allergens - so if you can remove it in favour of wood, vinyl or tile floors. Avoid heavy drapes that trap the allergens and dust. Keep the cat out of your bedroom and laundry (keep it off your clean clothes) and provide it with its own bed. Minimize other allergens in the house such as smoke, dust, moulds, scented candles, chemicals and pollens etc. Multiple allergens are linked to the development of more severe allergic reactions and asthma. Create outdoor enclosures for your cat so it can spend some time out side and not confined to an enclosed house and you get some fresh air in your home. Keep the cat litter in a well-ventilated area and dip rather than pour when you empty it and use litter that is as dust free as possible. Use high-efficiency air cleaners, either central or portable. Check with your allergist for any anti-inflammatory therapy or possibly desensitisation ("immunotherapy") options. Hope they finish working on a vaccine.